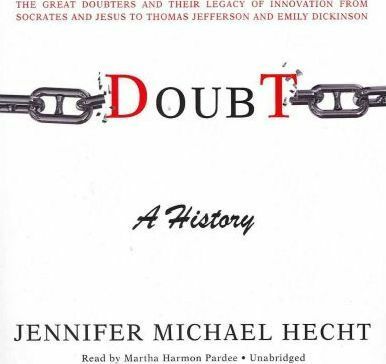 In this sweeping history, Jennifer Michael Hecht celebrates doubt as an engine of creativity and as an alternative to the political and intellectual dangers of certainty. Just as belief has its own history featuring people whose unique expressions of faith forever changed the world, doubt has a vibrant story and tradition with its own saints, martyrs, and sages. Hecht shows that the great doubters ponder the same issues as the great believers. She celebrates such heroes of doubt as Confucius, Socrates, Jesus, Wang Ch'ung, Hypatia, Maimonides, Galileo, Elizabeth Cady Stanton, Charles Darwin, Marie Curie, Emily Dickinson, Ludwig Wittgenstein, and Margaret Sanger, people who drove history forward by challenging the powers and conventional wisdom of their time and heritage.